Writing for Huffington Post Weird News! 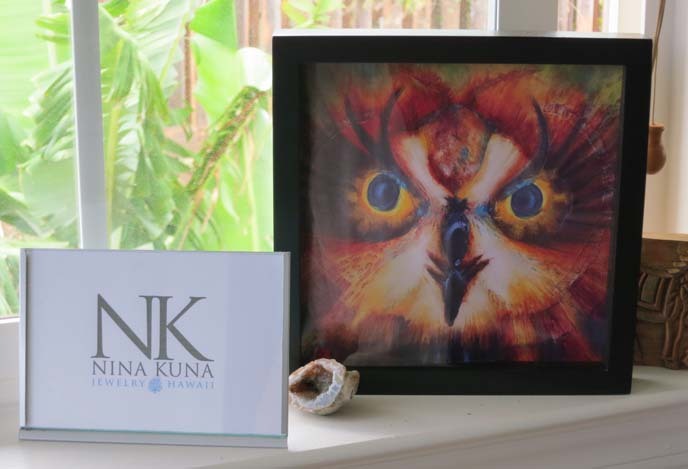 Maui fashion video on HuffPost Travel: Nina Kuna’s Hawaiian tropical jewelry. It’s been a good week… I’ve begun writing for Huffington Post Weird News, and my Hawaii video is published on Huff Post Travel! My film team and I jumped at the chance to interview Maui’s chefs and designers. But what awaited us? I had daunting visions of eating a roast pig while wearing a coconut bra. The island, it turns out, has open-air restaurants influenced by Asian plantation culture, and a surprisingly forward fashion scene. Watch my travel video on Huffington Post to see what I uncovered. I hope the “dressing room montage” made you smile! I’ve always wanted to film one. If you’re enjoying my work, please support with a Like below. Thanks for sharing the article on your social networks. 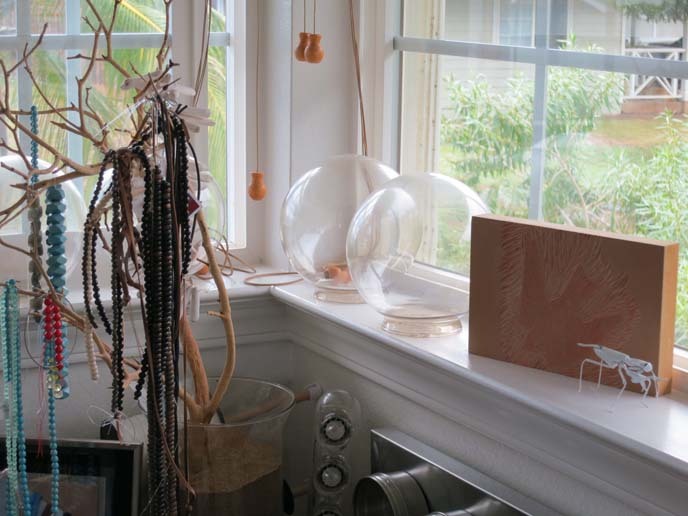 I also found out that Maui designers are a talented bunch, warm and influenced by their beach-and-wave surroundings. 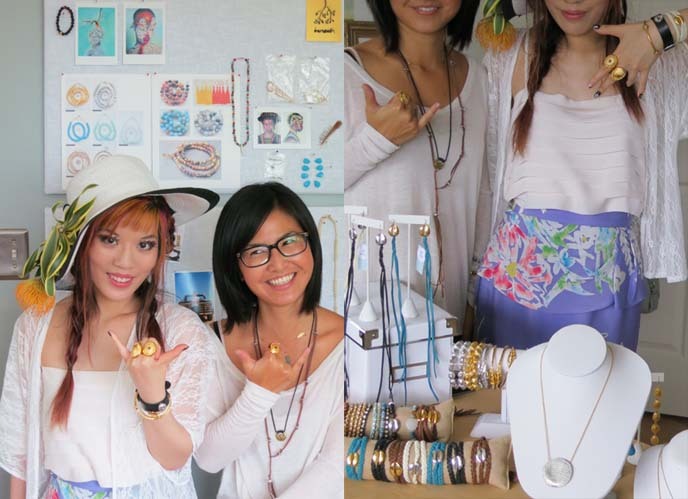 My crew and I filmed with Nina Kuna, young jewelry designer. She visited Maui, fell in love and made it home. Her design’s colors and materials reflect her love for the island. 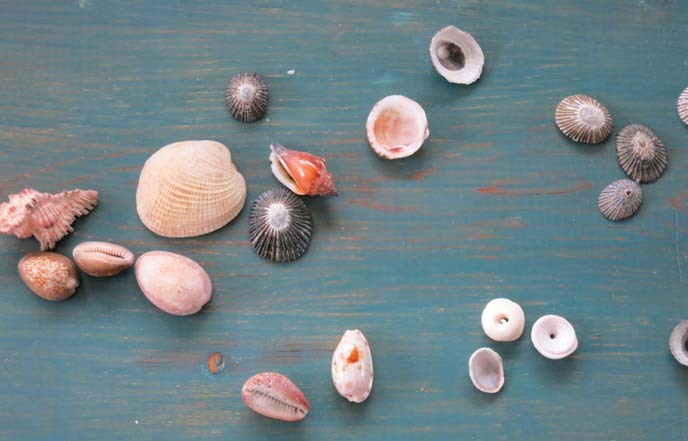 Nina turns natural found materials, such as shells washed up on Maui shores, into jewelry castings. Her braided wrap bracelet, strung with a gold-cast cowrie shell, is one of her most popular items. She generously gave my filmmaker and me a bracelet each! Nina also sells rings, earrings, necklaces, and bangles via her site. Black and white sunhat: from Hong Kong (similar to this hat by Emma Fielden). I decorated it with a fresh yellow protea flower. Nina’s work space, strung with bangles and beads. On the wall, a mood board plots her next collection. Nina’s also a professional photographer, whose food images often appear in magazines. 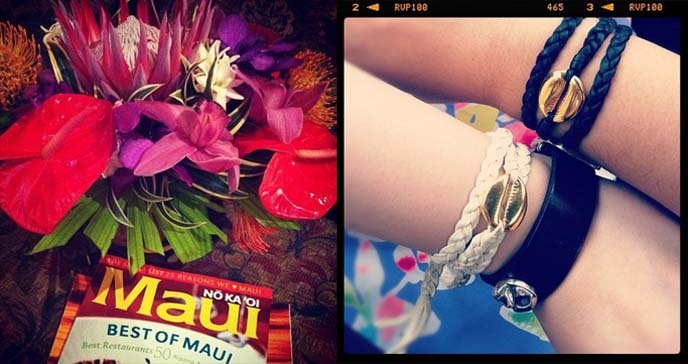 Whenever I wear her bracelet, I’ll think of Maui. 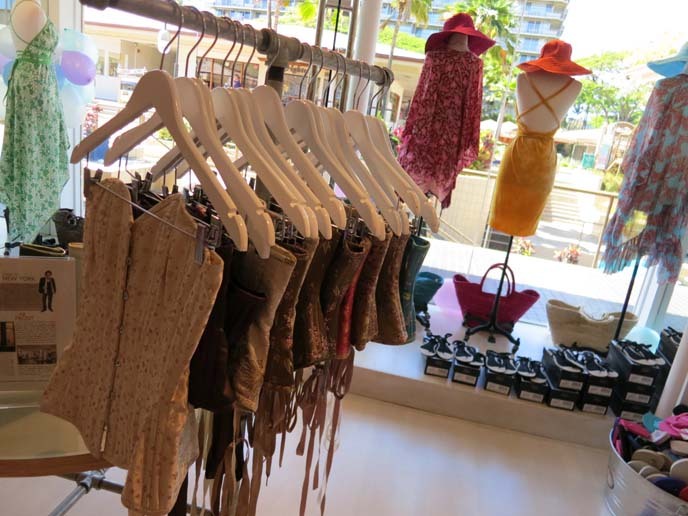 We also filmed the Maggie Coloumbe boutique in Whaler’s Village, Lahaina. Corsets — yes! Many of Maggie’s silk designs are inspired by her Korean heritage, such as the deep sleeves and gold prints. 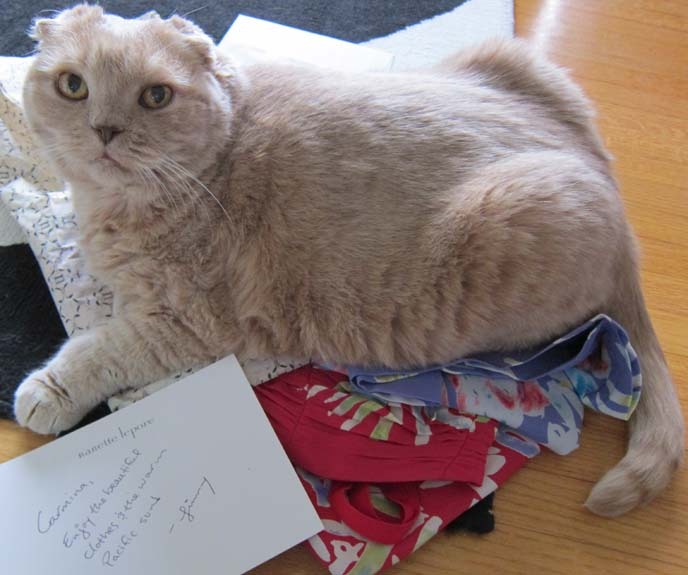 She first became interested in fashion as a child, playing in her grandmother’s suits. 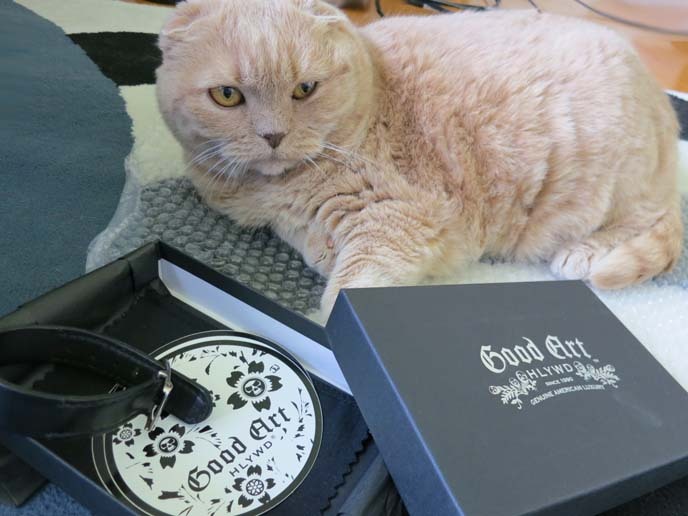 On this Maui press trip, I wore leather rock star accessories by Good Art Hollywood. Basil Farrow appreciates the bubble wrap they sent us. 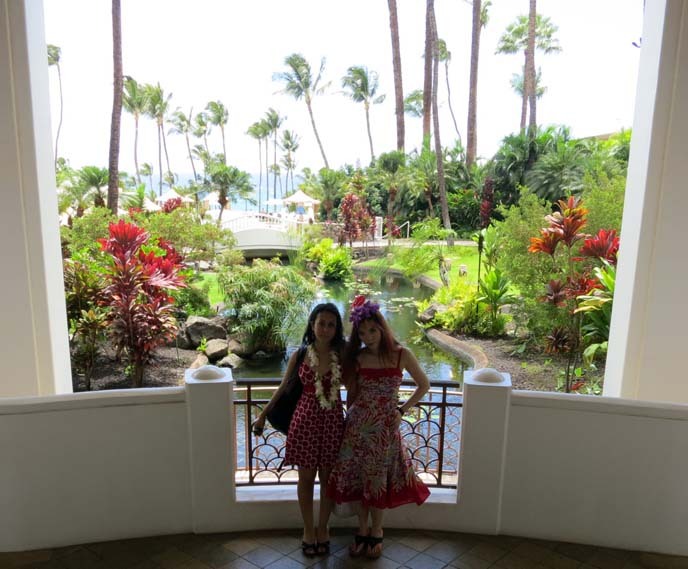 Mahalo also to Nanette Lepore, who dressed me in florals. In addition to the Travel section, I’m now also writing for HuffPost Weird News. Here’s my first article, deflating the rumors about Japanese bagel head inflation. PS: you can keep up with all my Huffington Post articles by following La Carmina’s author page. 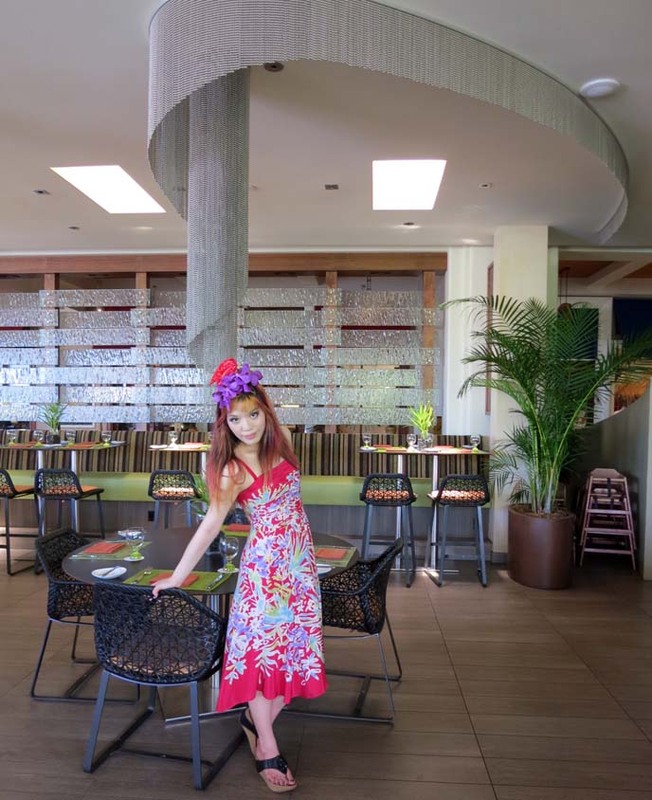 Are you surprised by Maui’s local fashion scene? Did you drool over the sushi and bentos in my Hawaii video? Hawaiian Paradise! 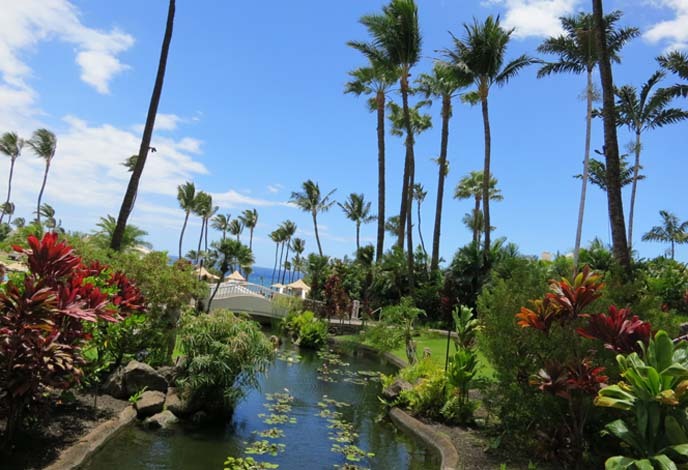 Beautiful Maui, Hawaii hotel: Fairmont Kea Lani in Wailea. Chef Pang of Ko restaurant, plantation cuisine. La Carmina in Hula-Land! I love how my Nanette Lepore dress flows; she’s an incredible designer. Red Malibu silk dress: gifted by Nanette Lepore. Get the same one here, or try the strapless version. 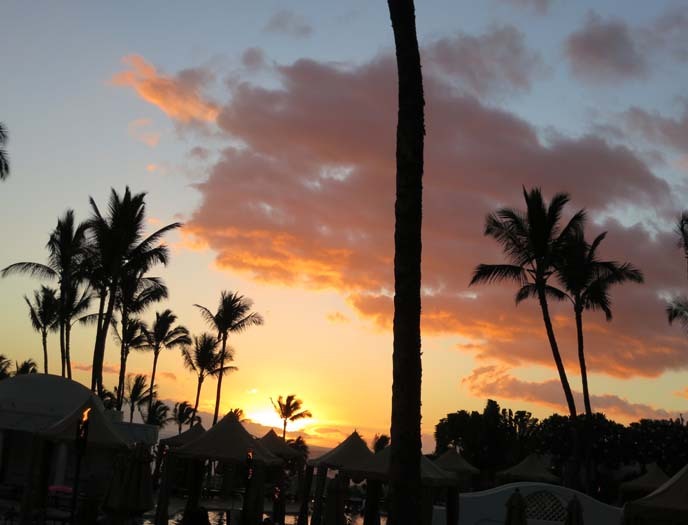 For the last two days of the Maui press trip, I stayed at the Fairmont Kea Lani in Wailea. I had a large one-bedroom suite to myself, with a balcony overlooking the pools and gardens. My filmmaker Melissa and I felt like we’d tripped into Kubla Khan’s Xanadu. 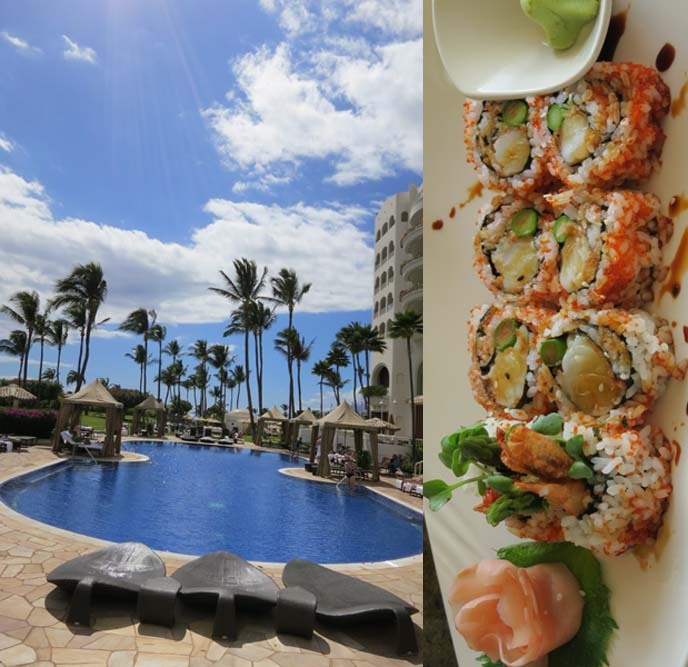 The Fairmont Kea Lani has several swimming pools (including adult-only), private beach access, and a koi fish pond that my cat would love. I turned the flowers around me into a hair fascinator. My skull-tastic bracelet, gifted by Good Art, matches my nail art. We filmed at the new open-air restaurant Ko. Ingredients are sourced locally, from relationships of trust. We said “cheers” on camera and tried his ahi tuna on a stick, grilled on hot stone. Phenomenal. Everything we tried was clean, simple, fresh. 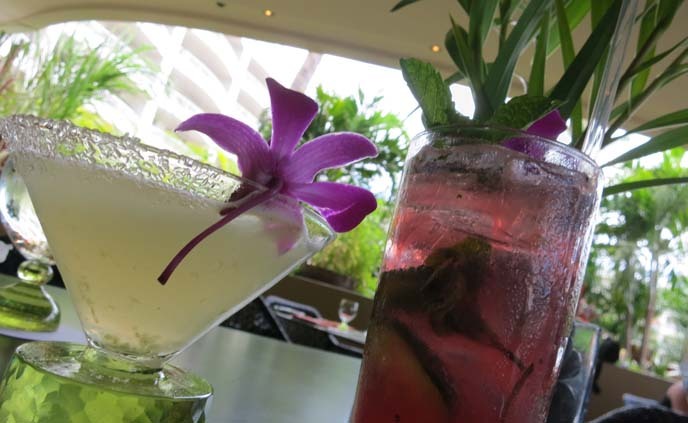 I ended up drinking three pomegranate cucumber mojitos (right). 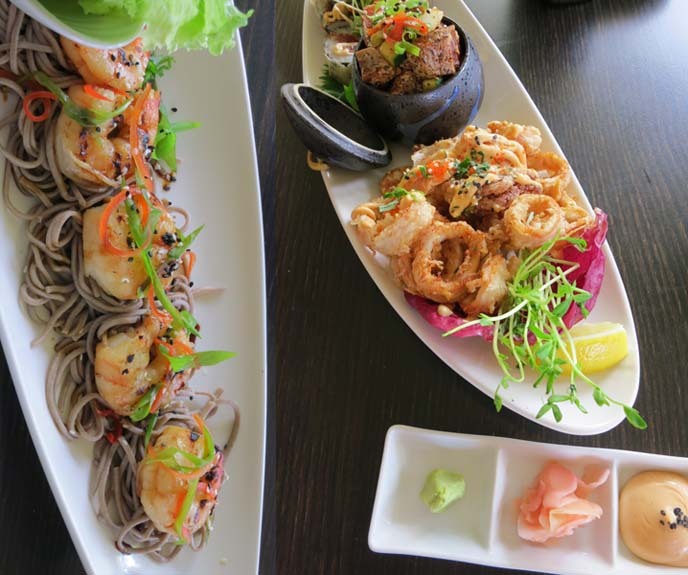 Examples of his Asia-Hawaii dishes: shrimp and soba, poke (raw fish salad), calamari. 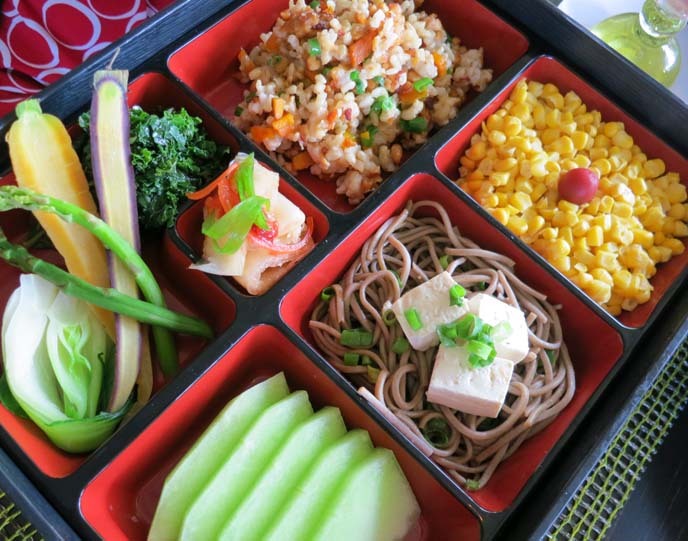 The macrobiotic bento box was perfectly balanced. Ko’s menu has entire categories for raw, vegan, gluten-free, and heart-healthy. Eating sushi with Chef Pang, overlooking the pool… one of the most heartfelt dining experiences in my life. I interviewed him for my travel video, so you’ll see more of our interactions soon. What’s the most memorable meal you’ve had recently, and why? What would you most like to eat from Ko’s menu?